This sounds overly dramatic, but I mean it when I say a good sandwich can elevate my day. A bad one can ruin it. It’s a simple matter of good ingredients in the right proportion, and when I find a beautiful sandwich, it brings joy. On a recent hot Saturday afternoon, we — Julie, J and I — set out on a walk that would lead us to Bunk Bar on SE Water Street. Bunk has earned a reputation of being the Mecca of Portland’s sandwich seekers, and that reputation has catapulted into the national spotlight through coverage on the Food Network and the Travel Channel. Bunk Bar, an outpost of the original, serves the same sandwiches but is open later, has a full bar and a music stage. Though we arrived in the afternoon, Bunk Bar still had a lively crowd and we barely avoided a mini rush that lined up after us. 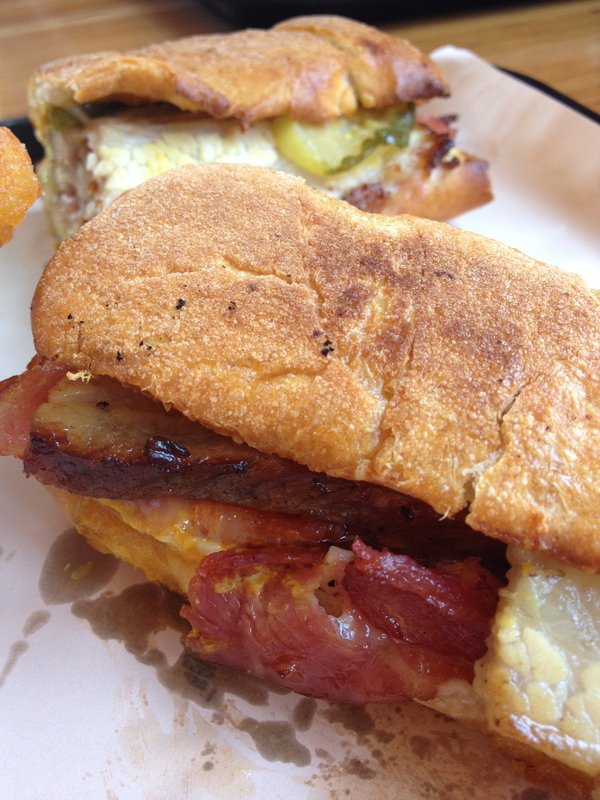 I grabbed a booth by the window, while Julie and J placed our order: three pork belly Cubano sandwiches and mole tots. 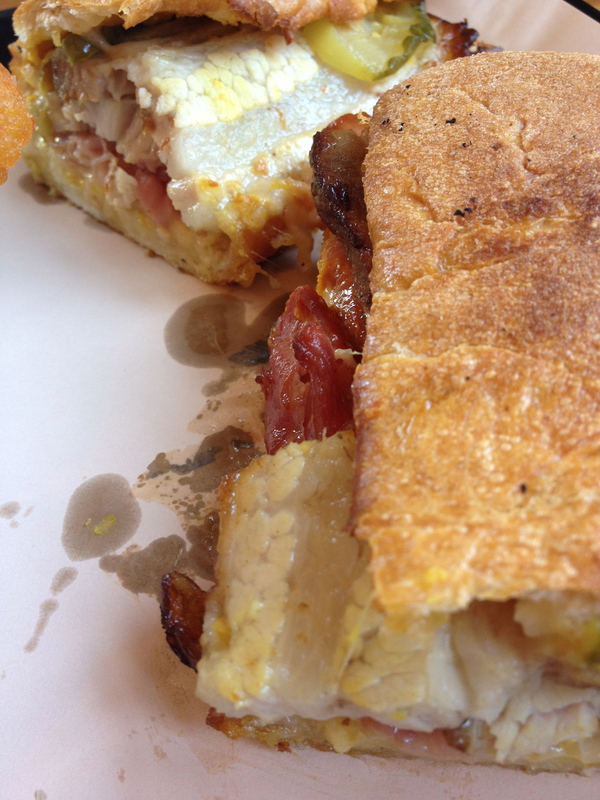 A well-made sandwich strikes a balance among all its ingredients, and Bunk’s pork belly Cubano does that with casual precision. The ciabatta bread has the perfect chewy-to-crunchy ratio, enough to envelop the sandwich and add flavor and texture, but not overpower what’s inside. And what’s inside can best be classified as “oh my goodness”: salty slab bacon, melted Swiss cheese, tart pickle, a good slather of mustard and silky pork belly that dissolves on the tongue. Each bite deliciously proportionate. The tots, bathed in rich dark mole sauce, were a tasty accompaniment, but entirely unnecessary. The sandwich was more than enough on this trip. Bunk gets it right. We knew that going in, but we were happy to have tried it ourselves, finally, and we can’t wait to go back. Sandwich joy. Is there anything better? 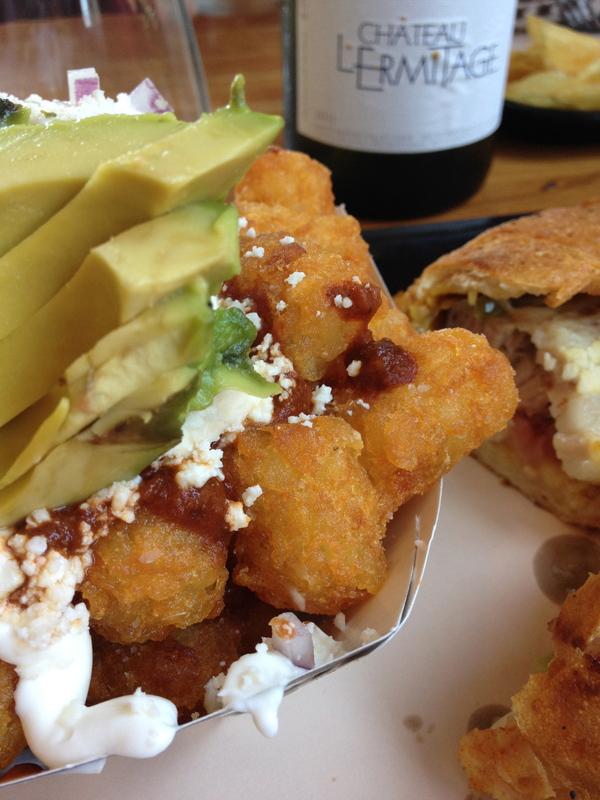 Crispy tots, mole, cheese and fresh avocado. For $4 a pop, this is a delicious bargain snack. Just another view of the same goodness. One of the best sandwiches I’ve ever had. Thanks Bunk Bar for not letting us down. Oh my goodness. Indeed!! Mole, avocado – my favorites. Well some of favorites. You can’t have too many favorites, right Lizbeth?